BEIJING - As China's auto market sets global records and holds the promise of even greater gains, the nation's top luxury carmaker is pushing for a bigger share - of its own partnership. While neither side in the 20-year-old joint venture between FAW Group and Volkswagen AG will comment publicly, industry watchers say a change in its shareholding is taking shape. 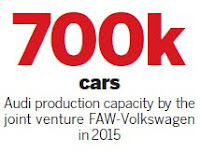 FAW currently owns 60 percent in the partnership, while Volkswagen has 30 percent and Audi has 10 percent. After the possible restructuring, FAW would retain a majority stake, but it would fall to 51 percent, with Volkswagen continuing to hold 30 percent and Audi boosting its share to 19 percent. While FAW and Volkswagen decline to publicly discuss the deal, industry observers find it believable as Volkswagen has long pushed for a greater share in the partnership. When the automaker came to China to form the joint venture with FAW in 1991, it didn't know the local market, so "a minority stake was a way to reduce risk and let the Chinese partner to play a more active role in exploring the market", said Zhong Shi, a Beijing-based independent automotive analyst. But as the local business turned hugely profitable - the Audi brand is dominant in the lucrative luxury segment - parent company Volkswagen naturally wants to reap greater rewards, he said. The Chinese government requires that Chinese companies hold at least a 50 percent stake in automobile joint ventures, so the ownership structure at almost every Sino-foreign partnership is 50-50. Today, Volkswagen Group's partnership with FAW is "unusual" because the foreign company holds a minority stake, analysts said. "In this case, Audi probably wants to be more successful," said Bill Russo, senior advisor at consulting company Booz & Co. It's a "logical expansion of business", he added. In the first seven months of this year, Audi reported sales of 167,000 vehicles in its largest market after Germany and has plans to more than double capacity at the joint venture to 700,000 cars in 2015 from the current 300,000. With an even bigger investment, the company clearly wants a bigger share of the earnings, analysts said. For FAW, the possible share restructuring would help its plans to go public, they said. The group has been preparing an initial public offering for several years. According to recent announcements by the group's two listed subsidiaries - FAW Car Co and Tianjin FAW Xiali Automobile Co - the parent company has received government approval to establish a new subsidiary for listing. The group plans to inject its FAW Car and Tianjin FAW Xiali holdings into the new company, the announcement said. Its business with Volkswagen is FAW's most profitable asset and the group is widely expected to fold its joint venture holdings into the new company, analysts said. They note the plan would need Volkswagen's consent, so the shareholding structure became a bargaining chip. Some analysts say FAW might also want its German partners to introduce new models and bring more technologies into the joint venture. But others note Volkswagen and Audi need bring in more and better products anyway to stay competitive in the increasingly fierce Chinese market regardless of the shareholding structure. Currently auto giants like Toyota, GM, Nissan and Hyundai are all in the race and the result will depend on who brings the latest technology and models to China - who invests more in the market, said analysts. Another auto giant that currently has a minority stake in its Chine joint venture is General Motors. It sold 1 percent of the joint venture Shanghai GM to its partner SAIC Group at the end of 2009, which tipped the balance to 51 percent ownership by SAIC. Earlier this month, General Motors CEO Daniel Akerson said GM has informed SAIC that it intends to buy back the 1 percent stake. Analysts said that a crucial reason for majority ownership by SAIC is a shining financial statement - it is able to integrate the earnings of the joint venture into its own. When the ownership change was consummated two years ago, SAIC said GM could call back the 1 percent only if a way was found for SAIC to keep the right to combine financial statements. Accountants said that would be possible through some complex capital maneuvering, but others suggest the Chinese automaker should avoid too much attention on the numbers game and focus on truly growing its wholly owned brands Roewe and MG.
"From both cases (FAW-VW and Shanghai GM), we can see one thing in common - Chinese automakers are still in the weaker position at their joint ventures," said Zeng Zhiling, director of JD Power Asia Pacific Forecasting. While most Sino-foreign automobile joint ventures have a 50-50 structure and are theoretically equal partners, foreign automakers usually have a majority ownership or even 100 percent share of the parts companies that provide components needed to make the cars. Zeng noted the way forward for development of the domestic auto industry is true homegrown brands. A visitor looks at a Nissan Motor Co vehicle on display at the company's showroom in Yokohama, Japan. The automaker plans to quadruple Infiniti's share of the Chinese luxury-auto market within five years. BEIJING - Nissan Motor Co plans to quadruple Infiniti's share of the Chinese luxury-auto market within five years as it rushes to make up a "ridiculous" amount of time lost to Volkswagen AG's Audi and Toyota Motor Corp's Lexus. Chief Executive Officer Carlos Ghosn has set a target of winning at least 8 percent of the luxury segment in the world's largest auto market by 2016. Infiniti has 2 percent at present. Market leader Audi has 34 percent while Lexus has 8 percent, according to industry researcher JD Power & Associates. Nissan's strategy to boost sales includes doubling the number of Infiniti dealers this year, adding five product lines over five years and airing its first TV commercials in a nation where primetime audiences can exceed 500 million. The company is also considering production in China to eliminate tariffs of 25 percent on imported cars. "We entered the Chinese mainland market even later than Taiwan and South Korea, and that's very ridiculous to anybody who has a bit of knowledge about the industry," Allen Lu, who left Ferrari SpA to become managing director of Infiniti's China unit last year, said in an interview in Beijing. "But, it's like running a marathon - you can't tell who will win after just 10 kilometers." Nissan, Japan's second-largest automaker, aims to more than triple worldwide Infiniti sales to 500,000 a year by March 2017, taking about 10 percent of the global luxury-car market. China became Infiniti's second-biggest market after the United States last year, according to Lu. The brand isn't sold in Japan. "We have good momentum in China and we should continue," Ghosn said last month in Beijing, where Nissan unveiled its mid-term China business plan. Infiniti trails Audi, Munich-based Bayerische Motoren Werke AG and Daimler AG's Mercedes-Benz in China. BMW has a 22 percent share of the luxury-car market and Stuttgart-based Mercedes has 14 percent, according to JD Power. Audi also ranked first in a new-vehicle sales satisfaction survey released on Aug 15 by JD Power. Nissan's Chinese venture Dongfeng Motor Co came second. The survey was based on responses from 11,496 owners and covered 57 passenger-vehicle brands. "The real challenge for Infiniti is to get on the consideration list for luxury-auto shoppers in China," said Bill Russo, a senior adviser at consulting company Booz & Co in Beijing. China has more than 1.1 million millionaires and an economy that expanded at 9.5 percent in the second quarter, so "it should be possible for Infiniti to carve out a piece of this expanding pie", he said. Toyota declined to comment on the challenge posed by Infiniti, saying in an e-mail that "we respect all competitors". Honda Motor Co, Japan's third-largest automaker, is preparing several new Acura luxury models for the US and Chinese markets, Chief Financial Officer Fumihiko Ike said in June. Infiniti got a late start in China, entering the market in 2007, about three years after Lexus opened its first dealerships there and more than a decade after Audi began local production. The two Japanese luxury units don't have production facilities in China, which means customers pay import duties that elevate prices. The Infiniti M25 sedan starts at 498,000 yuan ($78,000) and a Lexus ES350 costs from 545,000 yuan, according to pricing data compiled by Sina.com. That compares with 355,000 yuan for an Audi A6 and 418,600 yuan for a BMW 5-series, both of which are assembled in China. Infiniti's success may hinge on manufacturing vehicles in the country, said Klaus Paur, China managing director at Synovate Motoresearch. Ghosn said in June that Nissan plans to make Infiniti cars in either the US or China. Ghosn and Lu declined during separate interviews last month to comment on whether Infinitis will be made in China. La Saab è a un passo dal baratro. Mancano i soldi per pagare i fornitori e anche quelli per pagare gli stipendi ai suoi dipendenti che questo mese resteranno a secco. L'annuncio è stato dato oggi con una nota dove si spiega che la "Swedish Automobile (la Casa madre, l'ex Spyker Cars n.d.r.) è in trattative con vari soggetti per ottenere capitali a breve termine". Per reperirli è stato persino messo in vendita lo stabilimento di Trollhättan, attraverso una formula che prevede il successivo riaffitto degli immobili da parte di Saab. Insomma, dopo i blocchi della produzione, la ripartenza e un ulteriore stop imputabili al mancato pagamento dei fornitori, la situazione è tutt'altro che tranquilla. A conferma, c'è la minaccia da parte dei sindacati di avviare le procedure di bancarotta. Nessuna garanzia sul futuro. "Le discussioni proseguono", continua il comunicato, " ma non è sicuro che avranno successo e che il sostegno finanziario arrivi. Al momento vanno avanti le trattative con i fornitori per stabilire i termini di rimborso al fine di riprendere la consegna delle componenti". Secondo alcune stime il debito ammonterebbe a 300 milioni di corone svedesi, al cambio quasi 33 milioni di euro. Un'ancora di salvezza potrebbe arrivare dal magnate russo Vladimir Antonov che si è detto interessato a rilevare il 30% della società svedese mettendo sul piatto più di 30 milioni di euro. L'affare cinese. Solo poche settimane fa il costruttore svedese aveva annunciato un'intesa con due aziende cinesi, PangDa e Yougman Lotus che prevede una partecipazione al capitale per 245 milioni di euro, oltre all'alleanza strategica costituita da due joint-venture tripartite, rispettivamente per la distribuzione e la produzione in Cina di automobili con il marchio Saab e di veicoli commercializzati attraverso un sottomarchio. Ma tali alleanze devono essere sottoposte all'approvazione del governo di Pechino, che di solito ha tempi lunghi, come conferma Bill Russo, senior advisor di Booz & Co: "In Cina gli accordi sono molto di più complessi di quello che sembra: ci vuole tanto lavoro e tempo per renderli effettivi, almeno 18-24 mesi per un caso come questo". Le decisioni di Pechino. "Non sappiamo se le autorità di Pechino approveranno gli accordi", continua Russo, "tutto è possibile, certo. Ma in Cina è in corso un consolidamento dei produttori locali che prevede la riduzione del numero (oggi sono oltre 100 n.d.r. ): aggiungere un altro costruttore debole a un mercato già affollato non rientra nelle linee guida governative". Aug. 17 (Bloomberg) -- Nissan Motor Co. plans to quadruple Infiniti’s share of the Chinese luxury-auto market within five years as it rushes to make up a “ridiculous” amount of time lost to Volkswagen AG’s Audi and Toyota Motor Corp.’s Lexus. Chief Executive Officer Carlos Ghosn has set a target of winning at least 8 percent of the luxury segment in the world’s largest auto market by 2016. Infiniti has 2 percent now. Market leader Audi has 34 percent while Lexus has 8 percent, according to industry researcher J.D. Power & Associates. Nissan’s strategy to boost sales includes doubling the number of Infiniti dealers this year, adding five product lines over five years and airing its first TV commercials in a nation where primetime audiences can exceed 500 million. The Yokohama, Japan-based company is also considering production in China to eliminate tariffs of 25 percent on imported cars. Nissan, Japan’s second-largest automaker, aims to more than triple worldwide Infiniti sales to 500,000 a year by March 2017, taking about 10 percent of the global luxury-car market. China became Infiniti’s second-biggest market after the U.S. last year, according to Lu. The brand isn’t sold in Japan. “We have a good momentum in China and we should continue,” Ghosn said July 26 in Beijing, where Nissan unveiled its mid-term China business plan. Infiniti trails Audi, Munich-based Bayerische Motoren Werke AG and Daimler AG’s Mercedes-Benz in China. BMW has a 22 percent share of the luxury-car market and Stuttgart-based Mercedes has 14 percent, according to J.D. Power. Infiniti’s China sales were 11,513 last year, doubling from the year before, though still only 5 percent of Audi’s. Lexus sales rose more than 55 percent to 52,933 units in 2010, according to Toyota, Japan’s largest automaker. Audi also ranked first in a new-vehicle sales satisfaction survey released Aug. 15 by J.D. Power. Nissan’s Chinese venture Dongfeng Motor Co. came second. The survey was based on responses from 11,496 owners and covered 57 passenger-vehicle brands. “The real challenge for Infiniti is to get on the consideration list for luxury-auto shoppers in China,” said Bill Russo, a senior adviser at consulting company Booz & Co. in Beijing. China has more than 1.1 million millionaires and an economy that expanded at 9.5 percent in the second quarter, so “it should be possible for Infiniti to carve out a piece of this expanding pie,” he said. Honda Motor Co., Japan’s third-largest automaker, is preparing several new Acura luxury models for the U.S. and Chinese markets, Chief Financial Officer Fumihiko Ike said in June. Infiniti got a late start in China, entering the market in 2007, about three years after Lexus opened its first dealerships there and more than a decade after Audi began local production. The two Japanese luxury units don’t have plants in China, which means customers pay import duties that boost prices. Ghosn is counting on growth in China to help make Nissan Japan’s most profitable automaker for the first time since at least 1992. The carmaker’s Dongfeng venture, which makes Nissan- brand cars, has announced plans to invest 50 billion yuan by 2015 with the aim of raising annual auto sales to more than 2.3 million from 1.3 million. Infiniti has stepped up its marketing in China, airing its first TV commercial last September and participating in more than 50 local auto shows, Lu said. Sebastian Vettel, the Formula One champion, drove a 5.0-liter V8 Infiniti FX50 and a 3.7-liter V6 Infiniti G37 around a test track in Shanghai in April as part of Infiniti’s sponsorship deal with the Red Bull team. The number of Infiniti dealers will double to 50 this year, with a five-year target of 150 covering all major cities, according to the company. Five new product lines will augment the current QX, FX, EX, M and G-series vehicles, and department heads drive Infiniti cars to meetings instead of other brands.